Stay alert to other cars and drivers. Even if you are careful and obeying all the rules, it does not necessarily mean everyone is doing the same. In addition to being alert to cars entering and exiting the parking lot, this includes cars that are parked. A driver may pull his car out of his parking space in front of you or behind you. Stay alert to pedestrians. In addition to drivers going to and from their cars, other individuals may use the parking lot as a shortcut. They may be in a hurry, and not paying attention to cars. You should also watch for animals and debris in the parking lot. You may not see a small animal, a shopping cart, or debris that could cause an accident. Stay alert to these possibilities when your car is in motion. Do not park too closely to another vehicle. If another driver is not careful when he opens his car door, or exits his parking space too quickly, it could cause damage to your car. You do not want to spend money repairing your car after someone else has damaged it. Keep plenty of space between your car and other vehicles. 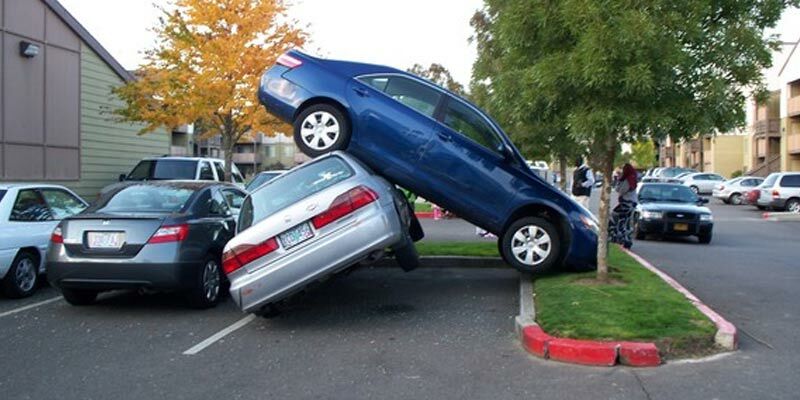 Drive slowly and cautiously when you are in parking lots. Even if a speed limit is not posted, you need to be sensible.Parking lots differ from open highways. Even if you are in a hurry, make a point of being careful. Exercise special care in inclement weather. Not only can rain and snow limit affect your ability to see, debris can be thrown against your car whenever it is extremely windy. If you must drive in snow or rain, be prepared. Use your windshield wipers, and make sure all windows and mirrors are as clean and dry as possible. Consider some modern technology. You may be interested in a new car that is equipped with a parking assist system, a vehicle cross traffic alert system, radar and ultrasonic systems, or rear view cameras. All of these systems can reduce your risk of accidents. Whenever possible, shop during times when there are fewer shoppers. When there are fewer shoppers, fewer cars using parking lots mean less chance of an accident. Consider shopping during the evenings on Mondays or Tuesdays. It is said that every driver should expect at least one car accident during his driving years. While carelessness can increase this risk, caution can lower it. If you begin by following these tips, you may be one of the many drivers never involved in an accident.In parking lots and other places, driving can be a safe, enjoyable experience.